Carving and turning on small-scale work presents a couple of problems: one is holding it while it is being worked on, the other is seeing what is being carved or turned, especially when working with very fine detail. While glasses are acceptable for use in these circumstances, we may need more help to achieve better detail and finish. 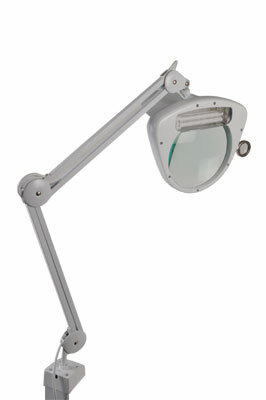 One solution is this Warco long reach light with magnifying lenses, which makes fine detail easy work. A clamp fixes the light to the workbench or table, which with the arms, has a 1168mm (46in) reach. The magnifying lamp section has an articulated joint that allows it to be manipulated into a variety of positions, for a variety of purposes. The main lens features a cover so it can be used as a lamp only with a 26W fluorescent energy bulb. Or, if you flip the cover up you will discover 1.75 magnification through the large main lens. 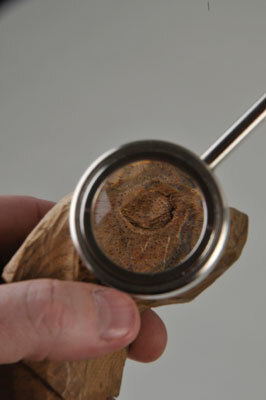 For finer work still, there is a hinged magnifying lens that will offer 4x magnification. The large lens enables you to get up close and personal to the work and is large enough so that both eyes can look through the lens - this is ideal for long-term usage and concentration on a piece of work. The smaller lens is for ultra-fine detail, but you have a smaller viewing area to look through, which may be a bit too small for some people. The light is bright, the jointing arms are sturdy and hold their position, the casing is reassuringly robust, and the head is easily manoeuvred into a multitude of positions. Treated with care there is no reason why this product will not last for many years. Although the bulb will inevitably need changing at some point, I am sure it is an option well worth exploring. I found it to be a great help on carvings and turnings already and you may find that it will provide a solution to some other problems you may have encountered. "I found it to be a great help on carvings and turnings"